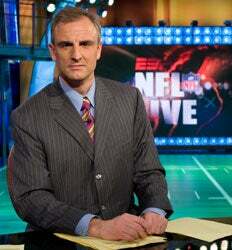 Radio Show Sends Random Listener To Bristol To Ask Trey Wingo About "Radio Raheem"
"Clemson Tom" got into the ESPN offices with zero credentials. He was recorded asking a gate attendant if Wingo, whom he described as a "wiry little fella," is in the building. Giggling excerpts from 1010 Sports after the jump. Wingo has been criticized for referring to Tampa Bay Buccaneers coach Raheem Morris as "Radio Raheem" on the air last week — a reference to either a character in Spike Lee's Do The Right Thing or to Cuba Gooding, Jr.'s character in Radio. Clemson Tom went to find out, and to get an apology. Nobody seemed to know if Wingo was in the compound that afternoon, so Clemson Tom left him a series of messages, both verbal and handwritten. In the first segment, he brightly tells the clueless gate attendant, "You just let him know that Clemson Tom was here to tell him that Raheem Morris is not a fan!" The second segment only gets better. Somehow, Clemson Tom drives directly into the parking lot. "Holy moly bajeezus!" he shouts. Zero filter on this guy: "I'm back in it! They didn't even stop me, fellas! Feel like it's the first time with my girlfriend! I don't even know what to do!" He then leaves a handwritten note for Wingo, suggesting that he send a gift basket as an apology for the comment, and then pretends to holler at Hannah Storm.